Make sure to check out our video of bumper Basic Construction and Stud Plate Bumper Mounting. 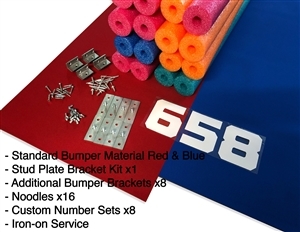 This kit comes with everything you will need to enjoy professional red and blue FRC bumpers. Use voucher code from KOP at checkout to get your bumper material free of charge ($36 value). IMPORTANT! You must INCLUDE YOUR TEAM NUMBER to verify your status as a rookie team for your voucher code to work. Choose from our selection of font styles or send us your custom artwork to art@robopromo.com. (We accept .psd, jpeg, and png files. Font stroke has to be at least 1/2". Send the highest possible quality image to ensure graphic compatibility. 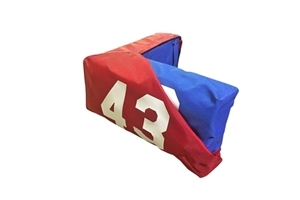 The Robo Promo Deluxe Reversible Bumper Kit comes with the all you need for professional reversible bumpers. Now with a click of a button, you can add everything to your cart. For Custom Numbers click here. For Reversible Material click here. This hardware kit is a quick solution for attaching bumpers to your robot. To purchase additional Stud Plates click here. Make sure to check out our video of bumper Basic Construction and Easy Bumper Attachment! This new, 6-inch corner bumper cover allows for quick and easy change of bumper colors (For 6-inch bumpers, click here). This new corner bumper cover allows for quick and easy change of bumper colors. 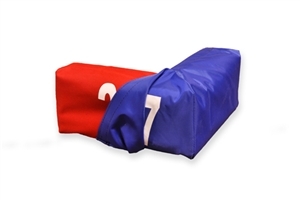 The RoboPromo corner bumper comes in red or blue. This one piece corner bumper is complete with our pre-sewn sleeve, pre-cut fun noodles, and two 5in x 8in x 3/4in pieces of plywood. Just staple in the open flaps, and you are done. This saves you time, weight, and money! Click here to order your 8-inch bumper covers. Be sure to check out our video resources below on corner bumper construction.